House and time at Malvern: No 2, 1910 - 1913. Died: 25 May 1915 aged 21 in France. Killed in action. Son of Herbert Hobbs, of Riding Mill, Northumberland and Falcons, Elmfield Road, Gosforth. b. 1894. Middle Shell—Matriculation Class. House Prefect. Shooting VIII. Great War, 2nd Lieutenant 8th Northumberland Fusiliers 1914 ; Lieutenant 2nd Batt. He was a fine long distance runner, and won the mile race for his College while at Oxford. 'At the outbreak of the war he had just completed his first year at Keble College, Oxford; he intended after his University career to be ordained. He was one of the first to be given a temporary commission in August 1914, and was sent for one month to the Officers' Training Camp at Churn, after which he was appointed to the 8th Battalion Northumberland Fusiliers. After several months training he was promoted Lieutenant and went to the Staff College at Camberley, subsequently being gazetted to a permanent commission in the Regular Army, 2nd Battalion Northumberland Fusiliers. 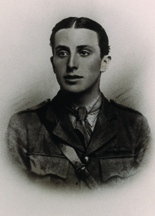 He went out to the front with a draft to his regiment on May 2nd, and was killed in action nr. Hooge on May 25th.' (Malvernian, Jul 1915).